At their regular meeting held on Wednesday, December 19, the Cricket Hall of Fame announced plans to launch a T20 tournament in honor of Hartford’s mayor Luke Bronin. The tournament which is set to be held during this summer will feature all the Hartford teams. Mayor Luke Bronin, right, presents Chambers with a check. 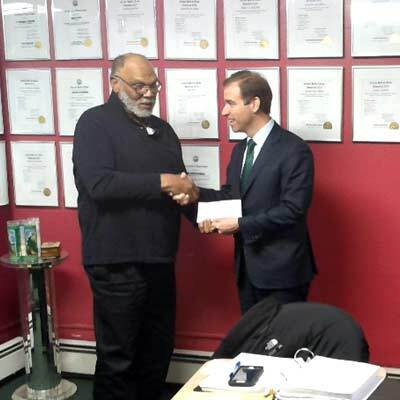 Bronin, who attended the meeting presented Executive Director of the Hall, Michael Chambers, with a check in support of the tournament. Chambers in response said that the tournament is a part of our development strategy to promote the game of cricket in Hartford. “This strategy is the result of our association with Education for Development and Support Network (EDSN). We at The Cricket Hall of Fame are very excited to join the EDSN which is dedicated to Research-to-Practice partnerships with us for long-term community engagements,” he added. A member of EDSN’s board, explained that with private, academic, and government sectors partnerships, the group will bridge workforce and quality-of-life development gaps between formal education and informal learning for entrepreneurial philanthropy and sustainable economic developments in North Hartford in ways that the Hall of Fame can never do by itself. “With a financial grant from the city or the private sector, the EDSN Foundation would be able to make software packages readily available for use in the community,” he said. “Technology should be used to engage students and parents alike in revisiting a meaningful education experience,” he added. Professor Desmond Green, founder of the Reverence For Life Foundation and the Reverence for Life On Line University, who was also present at the meeting, discussed the value of working with the prison population inside the prison long before their release into the community. He spoke about the success the program had with the prison population in Jamaica. Patrick Hamilton, a substitute teacher, and a former star player with the Sportmen’s Athletic Club’s cricket team, explained that he enjoyed engaging the Hartford student population not only as a science teacher but also as a soccer and cricket coach.